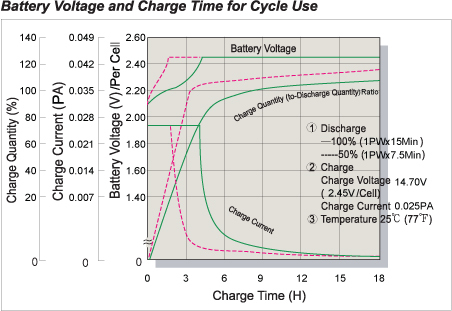 UPS Series batteries use the latest wafer-thin plate technology to provide optimum high-rate (5-min) performance. They are small and lightweight yet still deliver the power of larger batteries. With more than 260 cycles at 100% discharge in cycle service, or up to 5 years of standby service, the UPS series is the next generation of high-rate uninterruptible power. All UPS series batteries are rechargeable, highly efficient, maintenance free, leakproof, useable in any orientation and ISO/UL recognized. Various toys and hobby equipment. Fire alarms and security systems. Office computers, microcomputers and OA equipment. Never place the battery near or in a fire. Never heavily hit or improperly carry the battery. VRLA batteries may emit hydrogen gas. So do not bring fire or a heated object close to the battery, and never use the battery near a spark, fuses and/or equipment that emit sparks. Further, do not store the battery in a closed environment or incorporate it into a closed structure of an enclosure. Doing so can cause an explosion, fire, equipment damage and bodily injury. Do not connect the positive terminal and negative terminal of the VRLA battery with a wire or other metals. In addition, make sure metal tools, such as screw drivers, spanners, torque wrenches are properly insulated with vinyl materials before you use them in conjunction with one of our VRLA batteries. Short circuiting the terminals of the battery can cause burn injuries, damage to the storage battery, or trigger explosions. Never use the VRLA battery together with other types of batteries, such as dry cells and nickel-cadmium batteries. Do so can cause explosions, fires or bodily injury. 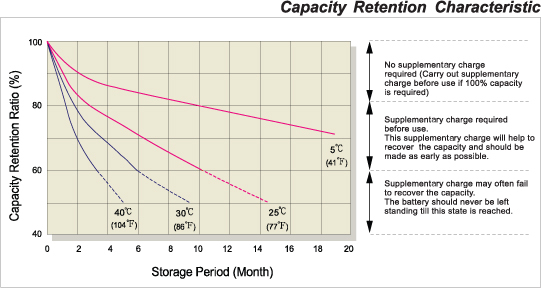 The performance of the VRLA battery may not be compatible with certain equipment. Any uncertainty about the specifications of the battery should be brought to the attention of our company. If there is any corrosion, cracking, deformation, heat generation, or other abnormalities to the VRLA battery upon its first use after purchase, do not use it. Please call the location where it was purchased. Using the battery with an abnormality can cause the battery to leak fluid, generate heat or explode. Store all batteries beyond the reach of children. Also keep children and infants away when charging a VRLA storage battery. The temperature range for using VRLA batteries are listed below. Usage outside the following temperature ranges can shorten battery life, lower its performance level, cause the battery to leak fluid, get damaged or deformed. Do not use or store VRLA battery where the surrounding temperature exceed 50°C, such as inside a hot automobile, in direct sunlight, or in front of a stove or a source of intense heat. Doing so can shorten battery life, lower its performance level, cause the battery to leak fluid, get damaged or deformed. 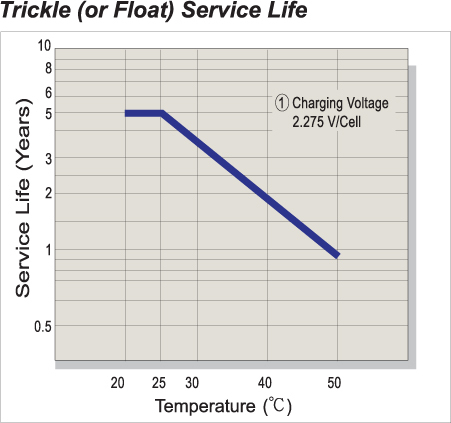 Do not let the VRLA battery's discharge current exceed the maximum value for the discharge current listed in its specifications. 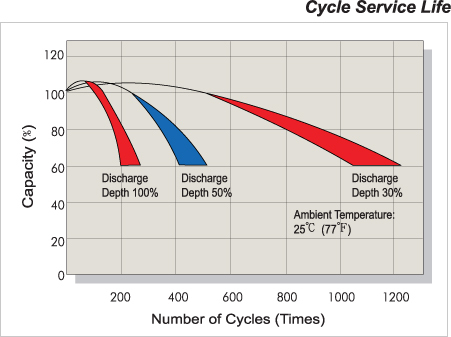 Exceed the maximum value for the discharge current can cause the battery to leak fluid, generate heat or explode. Make sure you always turn off the switches or the equipment after use. Also make sure the battery is removed from the equipment whenever the equipment is going to be out of sue for a prolonged period. Excess discharge of the battery can lower its performance level, shorten battery life or cause the terminals to explode. Before using the stationary value regulated lead acid battery (called "the VRLA battery" hereafter), make sure you read its accompanying user's manual or precautionary notes carefully. Since VRLA batteries posses energy, inappropriate usage can cause fluid leakage, heat generation, explosion or bodily injury. If you do not fully understand our storage battery user manual or precautionary notes, please direct your questions to our company. 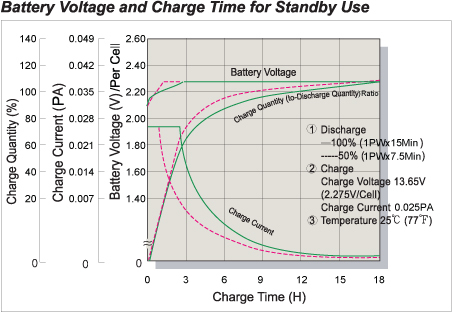 When charging the VRLA battery, use a dedicated charger and follow our company's charging conditions. Charging under different conditions can cause the battery to leak fluid, radiate heat or explode. Do not use the VRLA battery at a site that can get moist or immersed in water. Doing so can cause the battery's terminals to corrode, an/or cause electrical shock or fire. Take safety measures, such as wearing rubber gloves, when the voltage from connecting the VRLA battery in a series of 45 volts or greater. 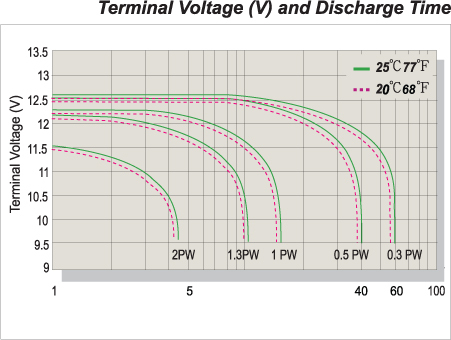 Make sure you connect VRLA batteries by their proper polarity. Connecting the battery in the wrong polarity can cause fire or damage to the charger. Never connect the VRLA battery directly to a power supply socket or an automobile's cigarette lighter without using a charger as a medium. Connecting the battery directly can cause the battery to leak fluid, generate heat, explode, cause fires or bodily burns and injuries. Do not incinerate or do not apply heat to the battery. VRLA batteries may burst if thrown into a fire. Do not disassemble, modify or destroy the battery. Doing so can cause fluid leakage, heat generation or explosion. Before cleaning or checking the VRLA battery, make sure you release your body's static electricity by touching a metal object or other effective measures. Also, do not use a dry cloth or duster to clean the storage battery. Always use a cloth that contains an adequate amount of moisture. Sparks created by static electricity can cause the storage battery to trigger an explosion. Replace the VRLA battery at or before the time indicated in the user's manual or on the battery. Usage beyond the required time of service can cause fluid leakage due to damages to the container, or cause fire due to power leakage. VRLA batteries contains dilute sulfuric acid which is a toxic substance. If the battery's internal fluid leaks out and gets onto your skin or clothing, make sure it is washed off with clean water. Additionally, if the fluid gets in your eyes, wash them with clean water immediately, and see a doctor. When dilute sulfuric acid gets in your eyes, it can cause a loss of eyesight, and when it gets on your skin, it can cause a burn on your skin.